Sold Out Football Tickets is website which provides to all soccer fans information, event fixture scedual and many more. 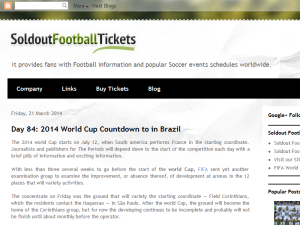 It is also provide the online tickets for football fans for all events held in all over the world before time. It provides fans with Football information and popular Soccer news worldwide. Soldout Football Tickets aims to provide fans with Football Tickets for popular soccer events worldwide. This what your Soldout Football Tickets BS Blog Ad will look like to visitors! Of course you will want to use keywords and ad targeting to get the most out of your ad campaign! So purchase an ad space today before there all gone! If you are the owner of Soldout Football Tickets BS, or someone who enjoys this blog why not upgrade it to a Featured Listing or Permanent Listing?